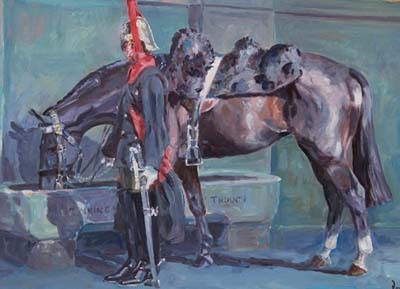 Three artists were given exclusive behind-the-scenes access to the Household Cavalry Mounted Regiment during last year’s Royal Wedding and the resulting work will be on display at Hyde Park Barracks, Knightsbridge, London SW7, this month (April 23-26), in a selling exhibition celebrating The Duke and Duchess of Cambridge’s one-year anniversary. For the past 12 months, Katie Scorgie, Tom Hoar and Daniel Crane have been creating some 40 paintings, sketches and background studies based on the regiment’s movements during the celebrations in 2011. The work features the hundreds of men and horses that were involved in the public ceremonies, as well as preparations backstage. Specialising in oils and water-colours, Mr Hoar, the son of an artist and the grandson of an architect, says he concentrated on ‘the immense individual and collective effort of regimental daily life and the hardworking graft of the soldiers’. of which feature in the exhibition. Proceeds will go to a new charity, the Household Cavalry Foundation, which will support the regiment’s operational casualties, as well as serving and retired cavalrymen and their families, plus horse welfare.